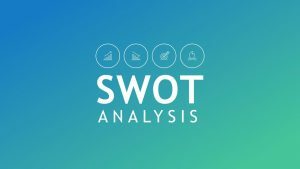 Performing a SWOT analysis of your business is very fascinating. The process does not take time and helps you to have a different perspective on your business. 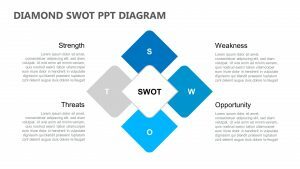 The significance of SWOT analysis is to aid you to develop a powerful business strategy by ensuring that you have considered all the strengths, weaknesses, opportunities and threats that face the development of your business. 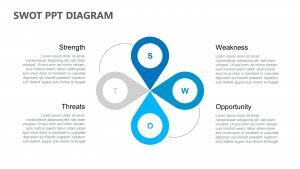 The initials SWOT stands for Strengths, Weakness, Opportunities and Threats. 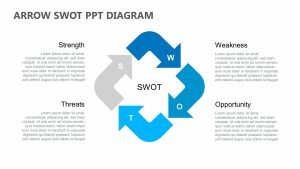 SWOT analysis uses environmental data to assess the position of a company by determining what helps the firm to accomplish its desired objectives and the obstacles that need to be reduced to achieve the best results. 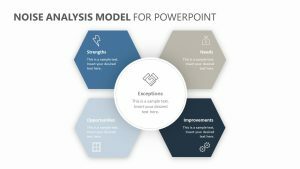 Strengths and weakness are generally internal to your company such as patents and reputation, while opportunities and threats are externally consisting of competitors and suppliers. It basically describes what a company excels at, separating it from the competition. They include; unique and advanced technology, loyal customer base etc. It stops a company from performing at its optimum level. It consists of areas that the business needs to improve to remain competitive in the market. Things like high levels of debt, turnover and lack of capital are weaknesses. These are external factors that a company can use to provide a competitive advantage. It refers to those external factors that can cause harm to an organization. 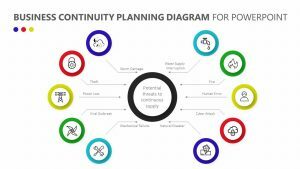 Common threats may include high levels of competition and increasing costs of inputs. 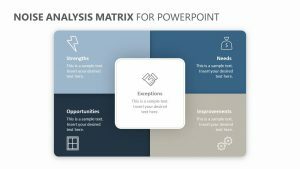 To get the best objective results from a SWOT analysis, the process must be properly conducted by a management team or people with distinct perspectives and stakes in your company. It may include customer service, management, sales and even your customers. 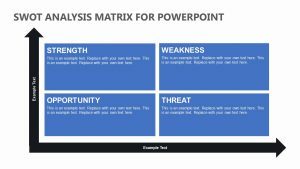 The SWOT analysis is mainly conducted using the four-square SWOT analysis template method. 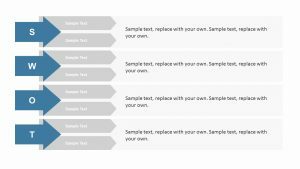 You can also opt to use a method that is easy for you to organize and understand the results in place. To identify the factors in all the four categories, it is significant to have a brainstorming session with your management team. 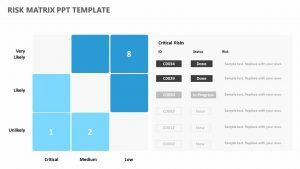 When going through each category, consider capturing those factors that are relevant in all the four areas. 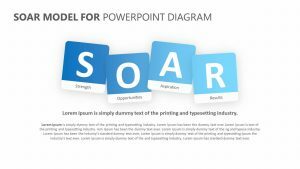 After completing the brainstorming session, make a final and prioritized form of SWOT analysis, keen to list all the factors in every category in a descending order from the highest in your category to the lowest. 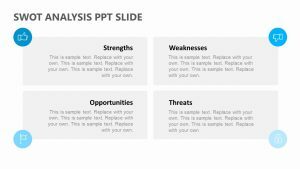 When it comes time to acquaint those you are planning a project with the SWOT Analysis strategy, there is no better way to do this then with the SWOT Analysis Table for PowerPoint. 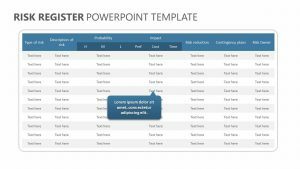 The SWOT Analysis Table for PowerPoint is a single, fully editable PowerPoint slide that allows you to change its colors and text at will. 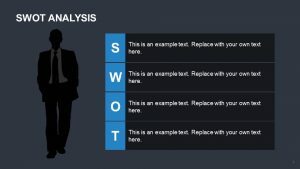 It has four different columns, each one of them separated by the different parts of the SWOT acronym. 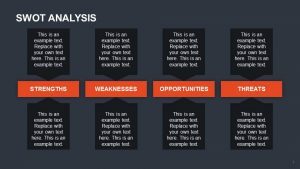 It is broken down into strengths, weaknesses, opportunities and threats. Below each title, there is room for you to add text.